Syrphid Flies or Hover Flies use mimicry to scare off those that could predate them - some of them copy a bee or wasps movements and colouring exactly. They are commonly seen around plants with aphids, as both the adult and the larvae of Hover Flies relish a nice plump aphid for lunch. 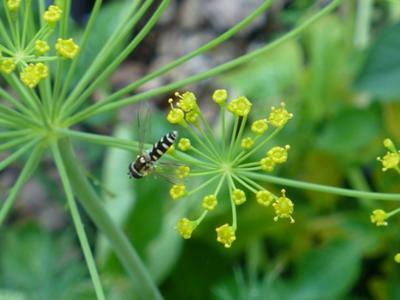 The adults also drink nectar, and are particularly fond of the flowers of parsley and dill. There is an argument right there for leaving as much of these kinds of plants as possible to simply re-seed themselves in the garden. Parsley is too strong for human consumption in the second year when it blooms so it's usually pulled out and discarded. However, once you see how many insects are drawn to the umbelliferous flowers you'll probably leave a little of it in your nectar corridor.